Described by National Geographic as “one of the most biologically intense places on earth,” Costa Rica’s Osa Peninsula is an unspoiled, natural wonderland that will challenge any serious photographer. The Peninsula is located at the southern-most border of this Central American country. Osa extends itself into the Pacific Ocean, as if to declare itself separate from all places. That is exactly how the Osa Peninsula will present itself to you and your camera, since it is a vast, undisturbed rainforest. In fact, the Peninsula, and the National Park of Corcovado that it includes, is the single largest expanse of lowland tropical rainforest in Central America and is one of the tallest rainforests in the world. Among and below this enormous canopy of lush green vegetation, rare and exotic species of mammals, birds and reptiles live in great abundance, protected in this sanctuary. For the intrepid wildlife photographer or serious shooter aspiring to learn advanced wildlife photography techniques, a journey into the Osa Peninsula requires great perseverance, an adventurous spirit and a burning passion to capture scenes and subjects unique to this one place in the world. This is the land of the secretive puma and jaguar, the majestic Harpy Eagle and other cunning raptors and the boisterous and unimaginably colored Scarlet Macaw. Here, four species of New World monkeys dance through the treetops and the rainforest is a cacophony of the cries and calls of toucans, long-tail hermit hummingbirds, trogons, blue-capped manakins, crested caracaras and ibis. The jungles of the Osa Peninsula are also a sanctuary for numerous species of unique frogs, including poison dart frogs, red-eyed tree frogs, masked tree frogs and massive cane toads. Many are covered in striking colors and patterns, providing enough subjects for a week of photographing nothing but frogs. 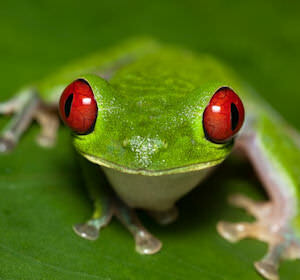 Significant to the photographer is that most of the habitats of the Osa Peninsula rainforest are readily visible. Capturing great images is still a function of patience and position, but the life force of the Peninsula will overwhelm you as soon as you enter the wild jungle. For the landscape photographer looking for spectacular views and vistas, the Osa Peninsula doesn’t disappoint. The trees themselves, especially since many are so tall, become worthy landscapes subjects. You’ll find locations at various distances and angles that present a group of massive trees as spires of a grand, natural cathedral as well as views of the top of the blanketing canopy. The Osa Peninsula is also a landscape of water and geologic features. Quiet streams and ponds present images that can only be compared to the mythical Garden of Eden, while waterfalls complement the rest of the natural beauty and lend their voices to the language of the jungle. Being a Peninsula, the Osa is also an ocean habitat. Not only are the beaches beautiful and pristine, but also migrating humpback whales, dolphins and other aquatic species can be seen and photographed in the nearby waters of the Pacific. A photography adventure on the Osa Peninsula of Costa Rica is an opportunity you shouldn’t miss. The best way to experience, to enjoy and to learn the photography techniques to bring home great images is to join Visionary Wild’s Costa Rica Advanced Workshop. For six total days, you will learn the specific visual and creative tools to shoot this panorama of wildlife and spend many hours roaming the Peninsula with your camera. Guiding you will be famed wildlife photographer Daniel Beltra and Justin Black, Visionary Wild co-founder and highly regarded landscape photographer and a leading advocate of conservation photography. Following daytime demonstrations and field work, the small number of workshop participants will gather during the evening for instruction in digital workflow techniques and share and critique each other’s daily output.